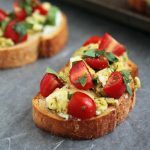 Shake up your morning routine with this breakfast bruschetta recipe – fluffy scrambled eggs, fresh tomatoes and basil atop crusty french bread make for an easy breakfast recipe that’s sure to be a hit! It was really only a matter of time before I added a heap of goat cheese to my breakfast and put the whole thing on top of crostini. This is quite possibly the greatest breakfast breakthrough ever. Easy to make? Check. Includes cheese? Check. Able to be eaten with one hand while you sit at the computer attempting to get work done? Checkity check check. Also, there are tomatoes and fresh basil AND some scrumdiddlyumptious (real word. Willy Wonka says so) scrambled eggs. The scrambled eggs are really what makes this “breakfast,” I think. That, and the fact that I started compulsively eating it at 9:30 in the morning. But you could just as easily serve it as a tasty appetizer at your next brunch soirée, or nix the eggs (if eggs are too breakfast-y for you) and call it dinner. VERSATILE! I like it. I loved the addition of pesto to the eggs here – I used a kale & basil pesto I had left over from dinner the other night and it was perrrrrfect. But it would be great with basil or arugula pesto as well. Basically, I’m in love, so if anyone needs me I’ll be standing over the stove shoveling the rest of these breakfast bruschetta into my face. CAN’T STOP WON’T STOP. Place sliced bread in a single layer on baking sheet and drizzle with olive oil. Bake at 375 for 8-12 minutes, until bread is lightly toasted. While bread is toasting, make the eggs. 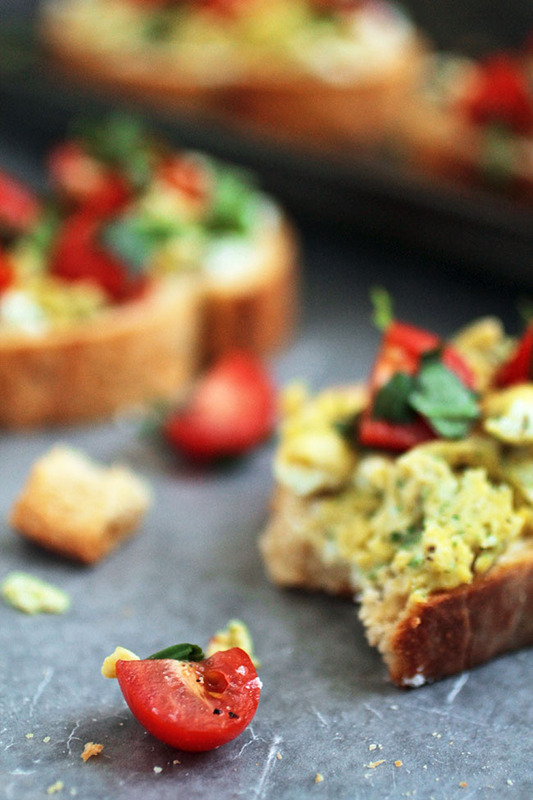 Combine eggs, pesto, milk, and a dash of salt and pepper in a small bowl and whisk to combine. Scramble egg mixture in a small skillet over medium heat and set aside. In a separate bowl, toss tomatoes with basil and a dash of salt and pepper. Set aside. When bread is toasted, you’re ready to assemble! 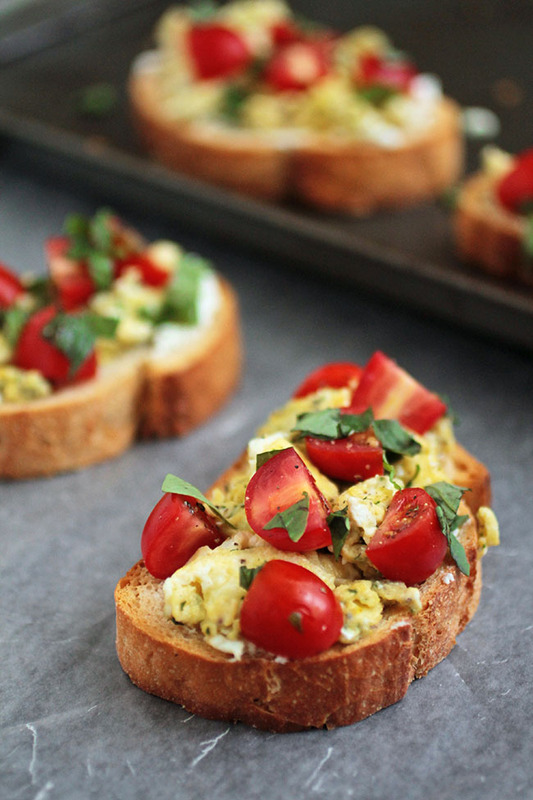 Spread each piece of toast with a layer of goat cheese, then follow with a layer of scrambled eggs and top with tomato mixture. Garnish with extra chopped fresh basil and a pinch of fresh ground pepper and serve immediately. When making crostini, always toast the bread RIGHT before you plan to serve it – if toast sits too long, it will get tough and dry out, making your final product less tasty and harder to eat. This sounds amazing! And I have all the ingredients already at home so I know what my breakfast is going to be tomorrow. I’m a huge fan of eggs and goat cheese together, it’s a perfect combination. Thanks for sharing, I can’t wait to try these! Thanks, Opal! This is one of our faaaaavorite breakfasts 🙂 I hope you love it! I just made this breakfast and fell head over heals in love!!! 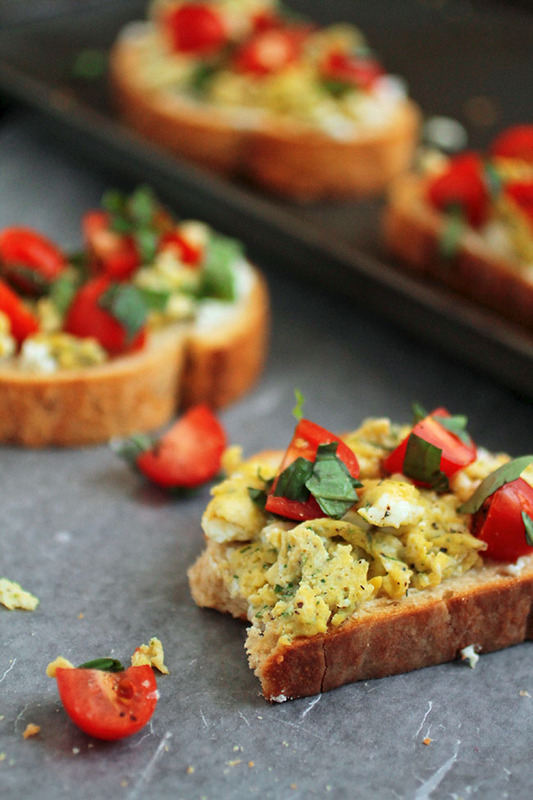 I didn’t have basil pesto so I used tomato-ricotta pesto instead and it was incredible too! I can’t wait to try it with basil… I added cottage cheese to the eggs for extra protein (cuz I’m vegetarian) and it gave them a nice consistency. I also pre-dressed the tomato with a rice-vinegar and chile-oil+olive oil vinaigrette I had on hand and that gave the tomato a nice extra layer of flavor, and topped it with a bit of parmesan. D-lish!!! Thanks so much for the recipe Jessie! I was really beginning to tire of the same ole’ everyday scramble. You breathed a much-needed breath of fresh air into my morning kitchen and I’m now newly inspired to keep expanding my AM repertoire. 🙂 Many blessings to all! I’m so glad you liked it! Tomato ricotta pesto sounds amazing – I’m going to have to try that! Thanks so much for letting me know how it turned out! 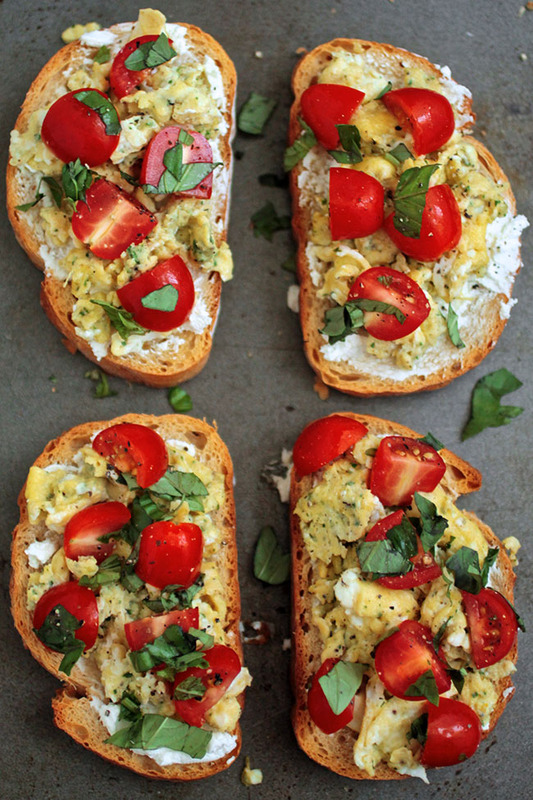 You’re speaking my language with this breakfast bruschetta, Jessie! While me and goat cheese sadly do not get along, I have no doubt I could make this happen with a feta spread or something equally delightful… or simply make it without while letting my husband chow down on the toast that includes goat cheese because that’s his favorite! Thanks, Erin! I be it would be awesome with feta or some ricotta. Mmmm this could replace my avocado toast craze! 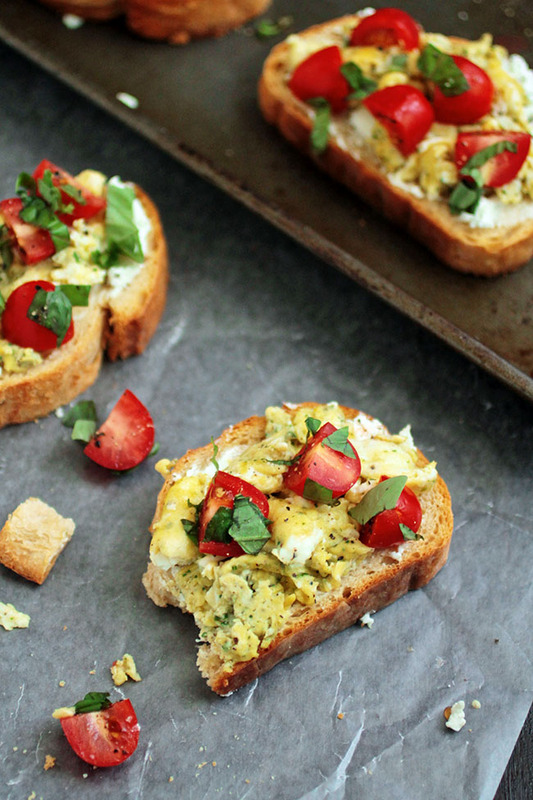 Tomatoes, goat cheese, eggs, bread — I’m in! What a wonderful breakfast. I’ll definitely be cooking this! And the photos are gorgeous!